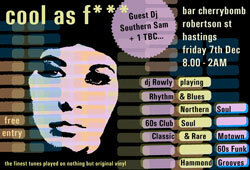 If you happen to be in the Hastings area on Friday 7th December, it’s worth checking out C.A.F. After a short lay-off, the night is back, offering Classic & Rare Motown, Rhythm & Blues, Club & Northern Soul, Funk & Hammond Heavy Dancefloor Jazz, courtesy of Ian ‘Rowly’ Rowland, Southern Sam and a guest DJ. All on original vinyl obviously. It’s free entry and it’s at Bar Cherrybomb, Robertson Street, Hastings, 8pm until 2am.